Candles were once used primarily as a way to provide lighting after dark and while they still can perform that simple duty today they can be used for much, much more. Candles can create a certain “look” for a room, they can create an “atmosphere”, provide a “mood” enhance a meditation or in magical realms, do much, more. To accomplish any of these ends a candle made overseas by some machine in some factory can be used but what if the candle that you use to accomplish your desired outcome is made by you, with your intent, your emotions, your energy, your envisioning of your desired outcome all were present when that candle was made…do you think the end result will be the same? 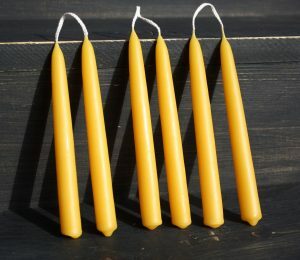 Participants will learn some tricks and tips on how to make proper, hand-dipped taper beeswax candles then proceed to making this type of candle to take home. Learn how to make any taper candle “drip-less”! The use of candle molds is an excellent way to make those ornate, fancy candles that sell in stores for between $10 and $25. After this section of the workshop you will be able to make these same candles for under $2 with the satisfaction that you made it yourself. As the name implies we will be covering what is needed to create a candle that will enhance and compliment a ceremony, ritual or whatever you would like to enhance with the use of a candle…a candle that was that was created by you, with your energy, your intentions , your emotions and your desires.